Software-Defined WAN, or SD-WAN for short, is at the leading edge of software-based networking deployments. SD-WAN offers significant business value for organizations with distributed branches in terms of business agility and the ability to leverage Internet bandwidth economics – put simply, cost savings. 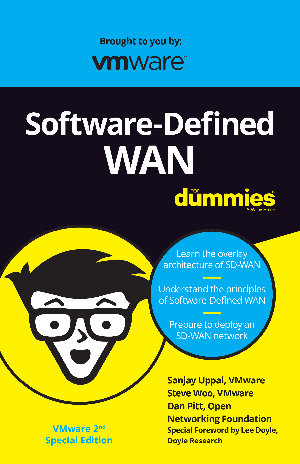 This Software-Defined WAN For Dummies book explains the waymn for IT and business managers to migrate to a distributed network which is less complex, more flexible and easier to manage. With this book, VMware and Dan Pitt make an important contribution to better understanding the future of WAN implementations.